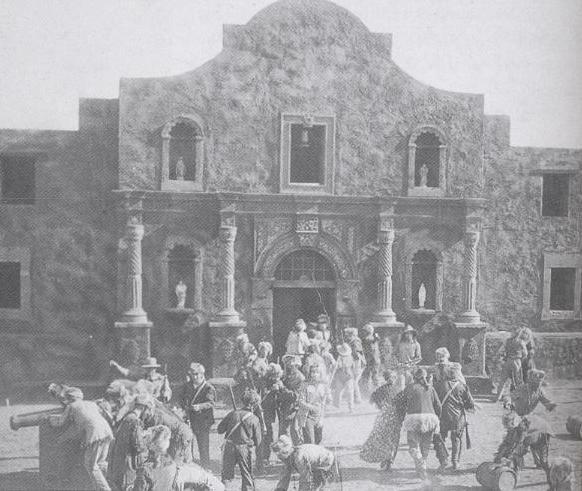 A screenshot from the 1915 movie Martyrs of the Alamo or The Birth of Texas. “Remember the Alamo!” is perhaps one of the most famous battle cries in American history. 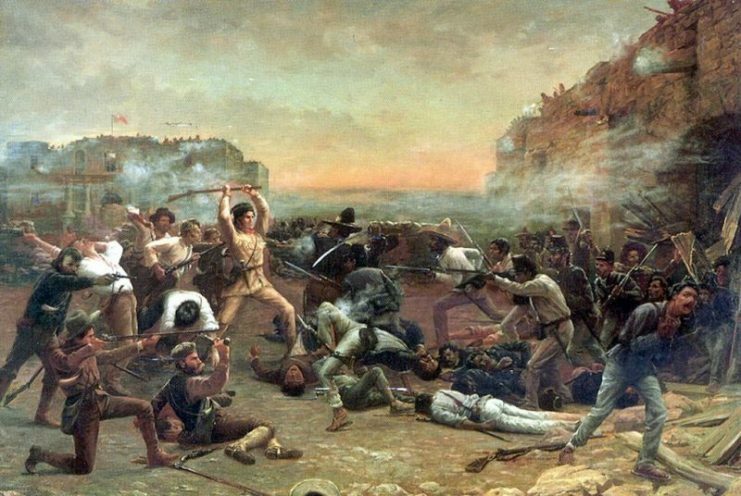 It’s derived from the Battle of the Alamo in San Antonio, Texas, on March 6, 1836. 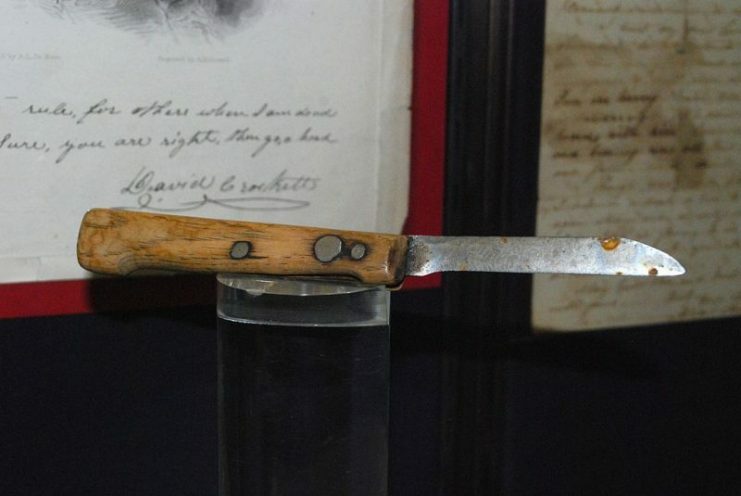 The battle has been immortalized as a turning point in American history and for involving a number of men who have since become legends in their own right, including Davy Crockett and Jim Bowie. But like many events of great historical significance, a number of myths about the battle have somehow become oft-repeated “facts”. The commonly-accepted version of facts and events of the Battle of the Alamo is that a handful of brave (and heavily outnumbered) English-speaking Anglo-Saxon American rebels (called Texians) defended Fort Alamo near San Antonio. They were supposedly fighting for their right to freedom and independence from the tyrannical oppression of the Mexican government (Texas was then a part of Mexico, which had itself recently achieved independence from Spain). The leader of the defense, Colonel Travis, apparently drew a line in the sand and asked for those willing to give their lives defending the fort to step forward. All but one man crossed, despite knowing that death was an inevitability. After a thirteen-day siege and a climactic two hour battle, all 189 fort defenders died in battle. Davy Crockett died with his trusty rifle, “Old Betsy” in his hands, with dozens of dead Mexicans troops at his feet. Many of the aforementioned “facts” about the battle contain grains of truth, but much of them are clear embellishments. First and foremost is the falsehood that the defenders of the Alamo were righteous revolutionaries oppressed by the tyrannical Mexican regime. The fact is that American colonists who had settled in Texas at that time did so by entering into an agreement with the Mexican government. In turn, the Mexican government provided them with land on the condition that they convert to Catholicism and become Mexican citizens. 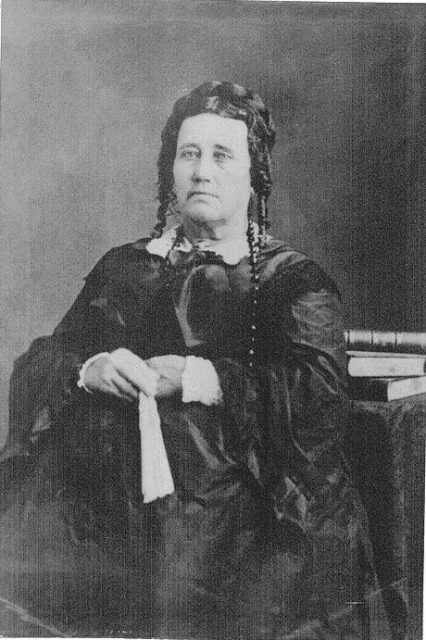 While many Texians did eventually fight for an independent state, an initial major cause for the fighting was simply for judicial reforms. Another myth about the battle is the line drawn in the sand. Truth be told, there is no historical evidence for Colonel Travis ever having said or done this. Meanwhile, the first account that reported the famous line in the sand was published decades after the battle. Further, there were more than 189 people defending the fort, not all of which were American settlers. The defenders numbered well over 200 and included a number of native Mexicans, Europeans, and two African-Americans. Unlike the popularly-recounted version of the battle, many of the defenders were originally unaware that they faced an inevitable death. They instead believed that reinforcements were on the way and that they could successfully defend the fort. However, as the siege wore on they began to realize that hope was likely lost. It is a testament to their bravery that they fought on anyway. Additionally, the defense was largely based on a poor strategic decision made by Colonel William Travis. Crockett had largely been in favor of conducting a guerrilla campaign against the Mexican forces, by using their long rifles and frontiersman skills to their advantage, which would likely have been successful. Sam Houston, commander of the Texian army, understood that the area around San Antonio was far from their base and too difficult to defend with the numbers they had. Houston recommended a retreat and destruction of the fort prior to the arrival of the Mexican army. 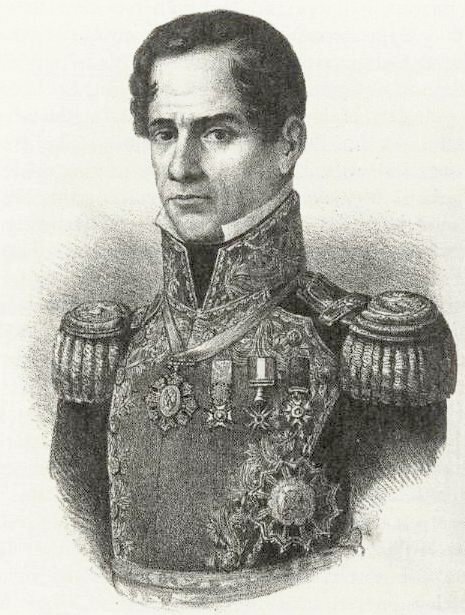 But Travis, bolstered by overconfident men–among them Bowie, who firmly believed the fort was defensible against an army–ignored these recommendations and chose to remain there with General Santa Anna’s forces advancing on them. Had he listened to Houston’s recommendations, he could have abandoned the fort without it appearing like an act of cowardice. What is no doubt true about the Alamo is that the defenders fought bravely and fiercely, with almost all of them fighting to the absolute bitter end. After besieging the fort for thirteen days, the two-thousand strong Mexican army commenced their attack at around 5 am on March 6, 1836. The first waves of attackers were repelled with cannons and musket fire which exacted a heavy toll. Yet there was only so much the heavily-outnumbered defenders could do. Actor Ray Myers, portraying Davy Crockett in the 1914 movie The Siege and Fall of the Alamo, which is classified as being a lost film. 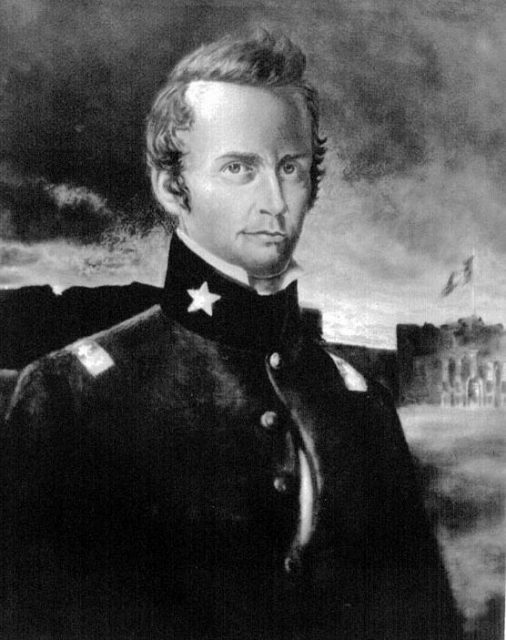 Colonel Travis was killed early in the fighting. 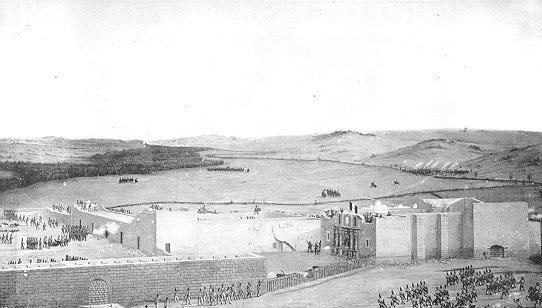 A short while later, the first wave of attackers managed to breach the walls and Mexican troops got inside the fort. They began a desperate hand-to-hand fight and the defenders were beaten back into the chapel where they made a valiant last stand. Bowie was likely killed in his bed as he had been laying low due to a debilitating illness and was likely already at death’s door. Davy Crockett, despite what the myths of the battle say, may have survived and been one of the six captured defenders who were later executed. 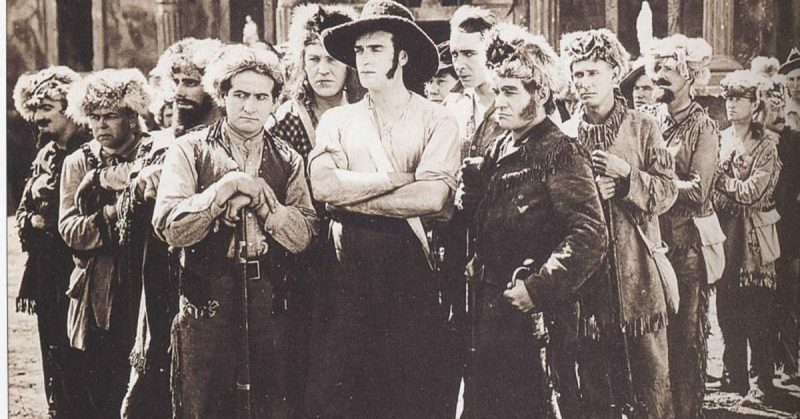 This is a scene from the movie The Martyrs of the Alamo or the Birth of Texas, released in 1915. The movie was supervised by D.W. Griffith. This still was reprinted in Frank Thompson’s 2005 The Alamo, p 110. Despite the myths surrounding the battle that state that either nobody in the Alamo survived or that only one person survived, there were actually 17 to 20 survivors, mostly women, children, or slaves. Moreover, the number of Mexican dead and wounded has generally been inflated, with modern historians estimating there might have been 150 to 200 Mexican dead as opposed to the oft-claimed 600 dead, plus a further 400 wounded during the thirteen day siege. Read another story from us: Remember the “Haunted” Alamo? Finally, the building used as the fort at the Alamo is not the same as the one standing there today. The fort was reduced to a ruin in April 1836 by Mexican troops and it was only rebuilt in the 1890s as a monument to those who had fallen there.